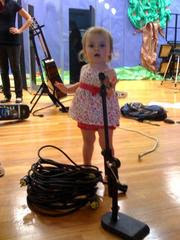 She found a drum mic that was just her size! I think she has seen her daddy do this a time or two! Taber, I just had the opportunity to look over your blog - it is so darling! After having the opportunity to see Addie in action at the lake, it was neat to get to see all the pics you have posted of her, in all kinds of situations. She is truly a beautiful child and so funny! And she has a great family so she is really blessed! Thanks for sharing this with me - I'll be checking on little Addie's growth!